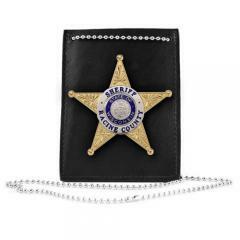 This leather badge holder can be worn around the neck but also features VELCRO® for belt or pocket use. 3 1/8" x 4 1/2"
Heavy duty and awesome quality. Quality leather, good look and feel will last a long time. Does this have a star depression for a metal badge to be attached? If so - is it the 5 or 6 star one? The badge will not be recessed. It features a hole for attaching your badge.